Heavy rains from the remnants of Hurricane Florence forced many bird species to lay low. This young female Ruby-throated Hummingbird hunkered down on the top rung of the tomato cage near our backyard hummingbird feeder. I took a series of rapid-fire shots of the bird sitting in the rain. 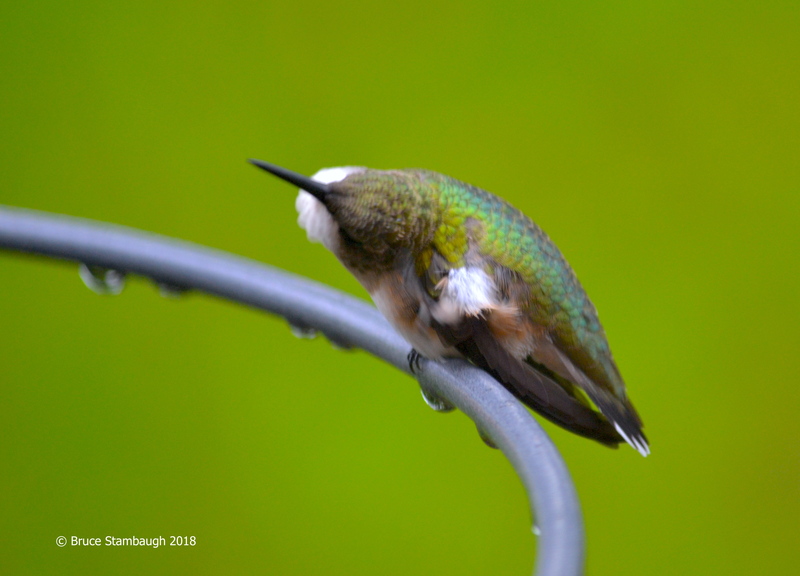 In one of those, the hummingbird shook the moisture off its feathers. I was fortunate to catch this awkward looking, twisting position. “Let’s Do the Twist” is my Photo of the Week. Not what I expected here from your great title! And the green background is nicely picked up in her colors. You are either lucky or very skilled. A bit of both, I’m sure! Thanks, Melodie. You are correct. Photography is a mixed bag of luck, which I prefer to label as “timing,” and skills. With such excellent lenses in today’s digital world, the skills often morph from the camera to software for manipulating photos. I haven’t made that leap yet and may not. I’m glad you pointed out the complementing background colors. I should have mentioned that in the text. By using my long lens for an object only a few feet away, the background, in this case, our backyard, is fuzzed out. Amazing photo Bruce. I love all the colors captured in its feather’s. Hope you fared as well as this tiny bird with all the rain I’m sure you also endured.